Is it cheating to have this much text in an art entry? I only say this because I feel the drawing itself already conveyed most of the feelings expressed in the text. Perhaps a bit more emphasis on Rainbow Dash's facial expressions would have been able to transmit those emotions just as well. Still this is a solid entry, and that nebulous end to Dash's trajectory makes me wonder what the effects of reentry speed had on Rainbow. I quite liked it. The amount of text here is a little odd. Still, good entry. This reads like a comics panel to me, so I have no problem with it. AFAIK, there is no specified limit for words used in art. Perhaps Roger can weigh in, but I’m pretty sure he’ll just say that as long as no rules are violated (such as using an image to get around word limits) it should be left to the voters to decide if it’s a problem. The art here is tight and compelling, with a dark theme that takes the prompt in an interesting direction. A top-tier piece. My #1 art pick. I love seeing comics show up in these, and this is sad and well-done and the alt text makes it just that much more poignant. This all began when I was thinking of the prompt as referring to spectral colors, and asking myself under what conditions a pony might radiate them. 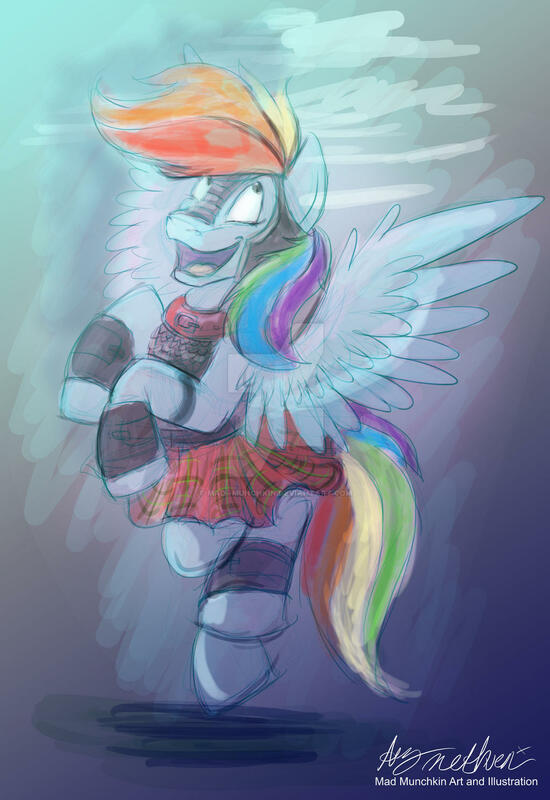 So, yes, I kilt Rainbow Dash. Sorry. I felt that the text was necessary to set the background and convey the point about spectral radiance. Dash in a space suit was drawn in Adobe Illustrator, and the starfield and landscape were done in Photoshop. I had a more complex comic in mind at first, but time constraints forced me to do it all in one big panel. Thanks for the kind comments and praise!